Imagine undertaking financial feasibility studies for property development projects and property investments with consummate ease on your desktop, laptop or notebook, i.e. without much prior feasibility software tuition but with plenty of 'thinking' already done for you and lots of easily-accessed help available to you. Feastudy 9 is now updated for the new (2018) Australian “GST at Settlement” laws. 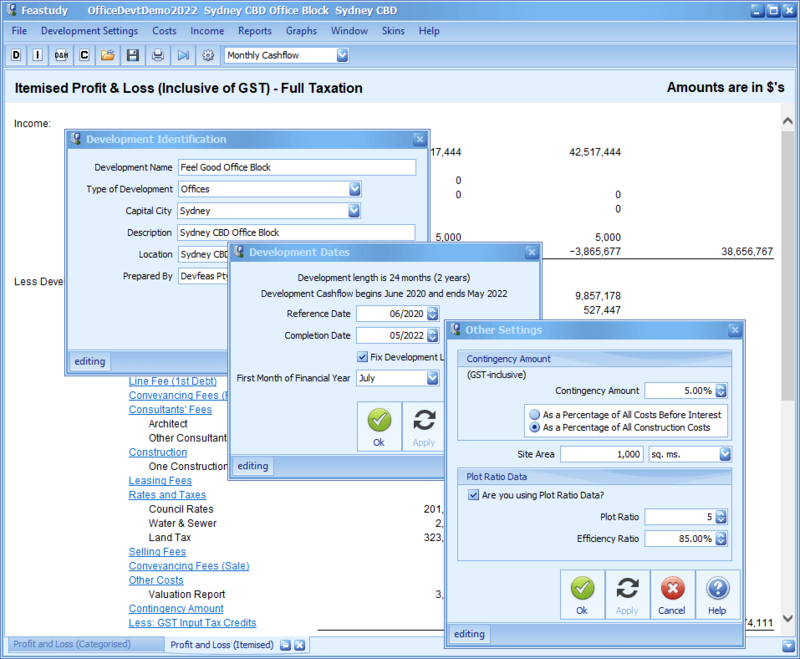 Consequently the program assumes that, at the settlement of each purchase of a “new Residential property” from a GST-registered developer, the purchaser must remit to the Australian Taxation Office (ATO) either: seven (7%) of the purchase price of that property if the Margin Scheme (MS) applies to the transaction; or all of the GST that applies to the purchase price of that property if the Full Taxation (FT) method of GST applies to the transaction. The financial feasibility of undertaking property development projects. After-tax investment feasibility studies for developing-and-holding income-producing real estate. After-tax investment feasibility studies for 'already developed' income-producing real estate. 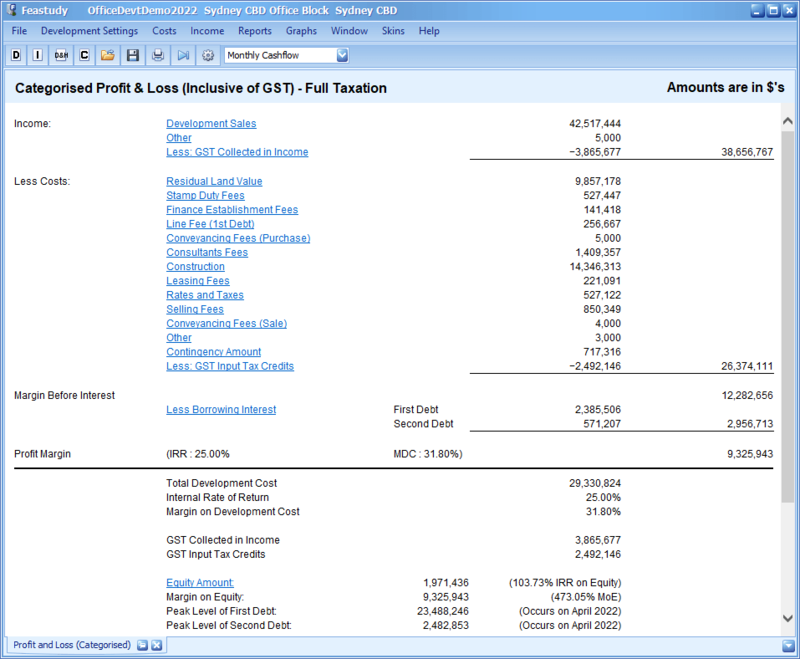 Residual values for property development sites and property investments. Residual land values for property development sites. Using either version of Feastudy 9 does not even require a knowledge of how to use Microsoft Excel because both versions of Feastudy 9 run independently of it. 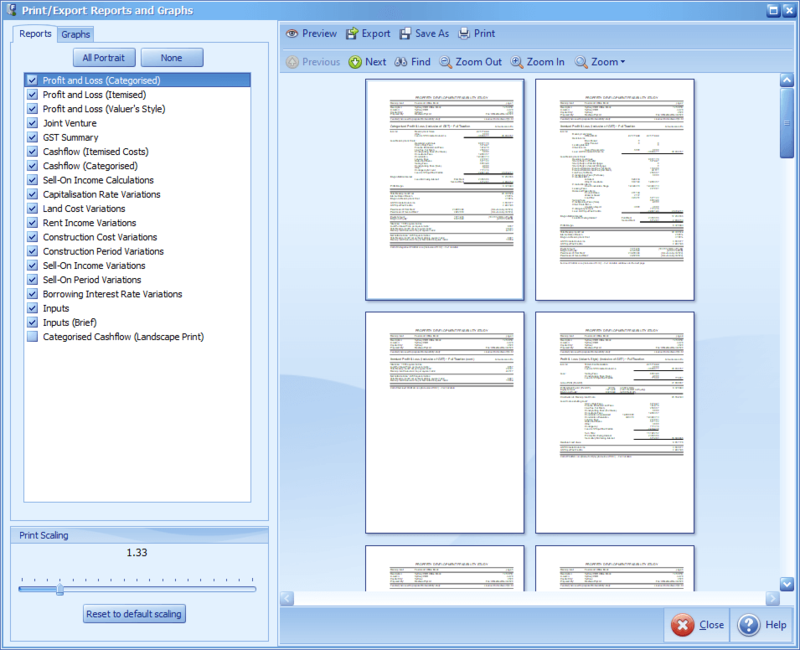 Furthermore, in Feastudy 9 Professional you can export every type of its reports for a feasibility study file to a CSV file. You can then open that CSV file in Excel and save its contents in an XLSX file. 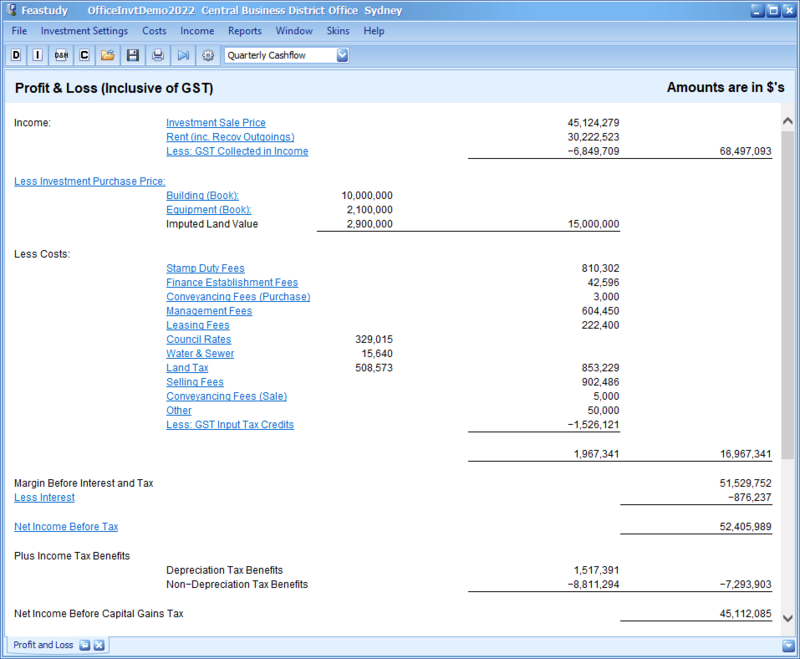 Three types of forecast profit and loss statements (including margin and internal rate of return information). Categorised cashflows and itemised cost cashflows for monthly intervals. Sensitivity analysis tables for variations in up to and including eight critical variables (such as construction cost and interest rates). Rental income for various tenants at various escalation rates. Marginal tax rate and capital gains tax rate. Depreciation on building, plant and equipment,. Graphs for development proposals are also available for viewing on-screen and printing to paper from both versions of Feastudy. 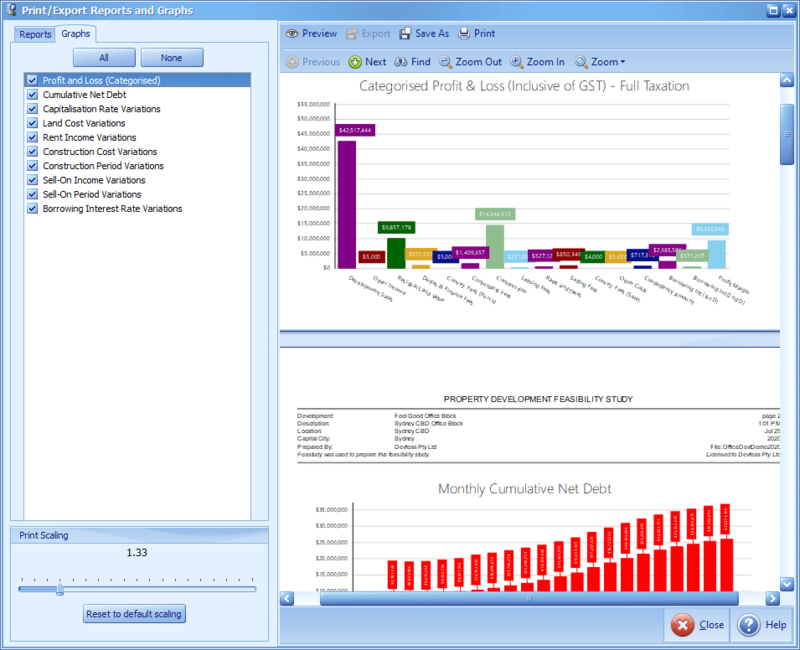 When the user enters his or her required IRR and/or margin criteria, after all other relevant variables have been entered, both versions of Feastudy 9 can be used to help determine the residual value of a development site for a particular development proposal and Feastudy 9 Professional can also be used to determine the residual investment value for an 'already developed' investment proposal. a facility for expediting an email message to Devfeas Pty Ltd.
Feastudy 9 is user-friendly in that it enables easy entry of data in a logical and consistent fashion, gives explanatory text for all data inputs, provides context-sensitive help for all data entry windows, allows convenient functions for creating, copying and deleting cost or income items in lister windows and gives on-screen and hardcopy report information in a comprehensive and easily understood format. It is quick, accurate and comprehensive, in dealing with all types of development and investment proposals, including multi-staged and multi componented projects. After you enter the relevant data, it can give you all of the critical financial information you need for four types of property feasibility studies: property development, property investment, residual land valuation and residual investment valuation. The program's output is readily acceptable information for property financiers and accountants. Feastudy 9 Professional can save you many hours of time creating and maintaining a feasibility study/cashflow worksheet on a spreadsheet program because only data entry is required. The program sets up a cashflow according to the dates you enter. No re-programming is required. It gives you the certainty that, even though your data from development to development or investment to investment will vary, the program will deal with your inputs in the same flexible and consistent fashion for all calculations. This means you can compare project or investment returns on an "apples for apples" basis. Sensitivity analysis tables and graphs for critical variables help you readily perceive the importance of securing a certain sale price, a certain interest rate, etc. to achieve required returns. The program is very user friendly and its reports are very reader friendly. Considering the time it can save you and its reliability, Feastudy 9 Professional is an inexpensive tool for the important job of establishing financial feasibility. GST input tax credits in costs and GST debits in income for developments and investments can be calculated and then displayed in the Profit & Loss, GST Summary and Categorised Cashflow reports. Income tax, Capital Gains Tax and depreciation for building, plant & equipment can be calculated for investments. Remissions of "GST at Settlement" by purchasers at the settlements of sales of "new Residential property" created by a GST-registered developer. Databases for Australian capital cities' property rates and taxes scales have been incorporated into the program for the financial year 2018-2019 and these scales can be edited as the scales change. (c) all reasonable operating and technical support for your use of the software. You can trial the interactive Feastudy 9 Professional demonstration program in Enhanced mode, which allows you to create new feasibility files, edit them and demo files, save all edited files, and print all reports and graphs (with a demonstration watermark across them) from those files for ten (10 days), by downloading the demo program from our website's Download page and installing it on your PC, however you will require a Password to do this. Please use our Contact Us form to get in touch with us and we will email the password and other relevant details to you. We have developed an instructional video for Feastudy 8 Professional which illustrates some of the features and benefits of using Feastudy 8 (and 9) for a residential development proposal. To get the video started, click on its play button and then, to see the video in a larger view, click on the YouTube button that then appears and then click the Full Screen button in the bottom right hand corner of the video’s display in YouTube.